REDDING, Calif. - Three Simpson University history students and one history alumnus presented research papers this spring at conferences in California. 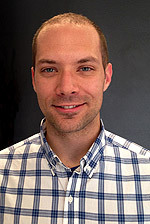 Caleb Sanders, a 2011 graduate from Weed who is pursuing a master’s degree in history at Sacramento State University, was selected by the university’s history department to represent them at the 29th annual CSU Student Research Competition, May 1-2 at CSU San Bernardino. He was one of 10 students selected from the entire university. Sanders, who will start teaching high school history and Bible at a Christian school in the fall, said Simpson University prepared him well for graduate school. 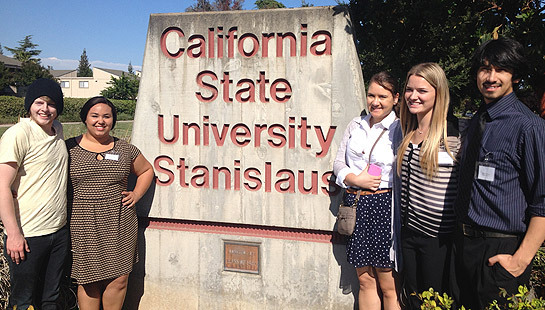 On April 18, Simpson University seniors Sadie Brown, Melanie Shank and Justin Thomason presented research papers at the Northern California Regional Phi Alpha Theta Conference at CSU Stanislaus. Their papers are titled “Superman: The Face of American Patriotism During World War II” (Shank); “Theodore Roosevelt’s ‘Battle for the Lord’: Blending Christianity and Socialism During the Progressive Movement” (Thomason); and “Somalis’ Nominal Independence: How Somalis’ Reliance on Foreign Aid Contributed to Their State Failure” (Brown). The conference is an annual event for history students who are members of Phi Alpha Theta, a national honor society for history. In addition to the student presentations, Simpson history professors John Ayabe and Phillip Fox chaired panels for students from the other universities. Simpson University’s bachelor of arts in history offers preparatory training for careers in education, public history, business, industry, commerce, government sectors, as well as graduate studies. It offers specializations in pre-law, U.S. history, European history, and Non-Western/Non-U.S. history. Learn more at simpsonu.edu/history. Group photo courtesy of Sadie Brown / Simpson University history students attend the Northern California Regional Phi Alpha Theta Conference at CSU Stanislaus on April 18. From left, Isaac Kieffaber, Sadie Brown, Kristen Smith, Melanie Shank, and Justin Thomason. Brown, Shank and Thomason presented papers at the event.